Astronomy For Beginners is a friendly and accessible guide to our universe, our galaxy, our solar system and the planet we call home. Each year as we cruise through space on this tiny blue-green wonder, a number of amazing and remarkable events occur. For example, like clockwork, we�ll run head-on into asteroid and cometary debris that spreads shooting stars across our skies. On occasion, we�ll get to watch the disk of the Moon passing the Sun, casting its shadow on the face of the Earth, and sometimes we�ll get to watch our own shadow as it glides across the face of the Moon. The Sun�s path will constantly change across the daytime sky, as will the stars and constellations at night. During this time, we�ll also get to watch the other majestic planets in our solar system wander the skies, as they too circle the Sun in this elaborate celestial dance. Astronomy For Beginners will explain this elaborate celestial dance � the patterns of the heavens, the equinoxes and the solstices, the major meteor showers, and the solar and lunar eclipses. In addition, Astronomy For Beginners will also take you on a guided tour of the solar system and beyond. We�ll discover how the way we measure time itself is intimately related to celestial phenomena, and we�ll furthermore explore our historical and continuing mission to understand our place in this marvelous universe in which we find ourselves. 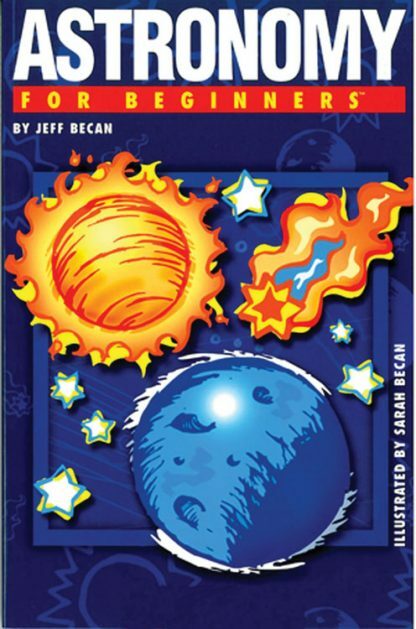 Oh yeah, one more thing: Astronomy For Beginners will not only help you become an expert in space and time � but it also promises to be a pretty fun ride! Jeff Becan loves his family, his friends and his life on planet Earth. While living here, he has learned how to sail, how to juggle, and how to mentally surf. He has done volunteer work for the poor in Mexico, has counseled patients at a psychiatric institute, has done production work for theater, television and film, and has also worked as a travel writer. For three years he managed a hostel on a faraway island in the north Atlantic. He once climbed a mountain, escaped a bizarre mind-control cult, and has fallen into the river Seine. He holds degrees in sociology and linguistics. Sarah Becan is a comics artist, illustrator and designer. She has provided illustration and design work for a wide variety of clients, from struggling local rock bands to giant, heartless corporations. Sarah is also cofounder and head of Shortpants Press, a small press for minicomics, art prints and zines. She lives in Chicago with her boyfriend, Niles, and two cats. You can see more of her work at www.jakze.com and www.shortpantspress.com.